On May 13, 1945, twenty-four officers and enlisted men and women stationed on what was then Dutch New Guinea boarded a transport plane named the Gremlin Special for a sightseeing trip over “Shangri-La.” A beautiful and mysterious valley surrounded by steep, jagged mountain peaks deep within the island’s uncharted jungle, this hidden retreat was named after the fabled paradise in the bestselling novel Lost Horizon. But unlike the peaceful Tibetan monks of James Hilton’s book, this Shangri-La was the home of Stone Age warriors—spear-carrying tribesmen rumored to be headhunters and cannibals. But the pleasure tour became an unforgettable battle for survival when the plane crashed. Miraculously, three passengers survived—WAC Corporal Margaret Hastings, Lieutenant John McCollom, and Sergeant Kenneth Decker. Margaret, barefoot and burned, had no choice but to wear her dead best friend’s shoes. McCollom, grieving the death of his twin brother also aboard the Gremlin Special, masked his grief with stoicism. Decker, too, was severely burned and suffered a bloody, gaping head wound. Emotionally devastated, badly injured, and vulnerable to disease, parasites, and poisonous snakes in the wet jungle climate, the trio faced certain death unless they left the wreckage. Caught between man-eating headhunters and the enemy Japanese, with nothing to sustain them but a handful of candy and their own fortitude, they endured a harrowing trek down the mountainside—an exhausting journey into the unknown that would lead them straight into a primitive tribe of superstitious natives who had never before seen a white man–or woman. 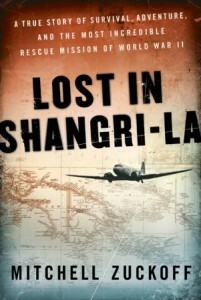 Drawn from personal interviews, declassified Army documents, personal photos and mementos, a daily journal kept between the crash and the rescue effort, and original film footage, Lost in Shangri-La recounts this incredible true-life adventure for the first time. Mitchell Zuckoff reveals how the determined trio—dehydrated, sick, and in pain—traversed the dense jungle foliage to find help; how a brave band of Filipino-American paratroopers, led by a dogged captain, risked their own lives to save the survivors; how the Americans would be protected by and eventually befriend a noble native chief and his people; and how a cowboy colonel was willing to risk a previously untried rescue mission to get them out. A riveting work of narrative nonfiction that vividly brings to life an odyssey at times terrifying, enlightening, and comic, Lost in Shangri-La is a thrill ride from beginning to end. This book gets grittier than most fiction books that I normally read, but I was compelled to soak up every minute detail because I knew that this wasn't the work of someone's imagination - this really happened and it happened to real people who were merely planning a quick sightseeing flight. I found this book deeply engrossing and very well researched and written. It was riveting and I read it all in one sitting. Because it was also a true, historical account, it helped me to better understand what New Guinea and the Pacific Islands were like during the Second World War. This book was funny, poignant and real and I would encourage both men and women who like history, particularly human interest stories of the wars to pick up this book - it is fascinating! Mitchell Zuckoff’s honors include the 2000 Distinguished Writing Award from the American Society of Newspaper Editors. His book Choosing Naia: A Family’s Journey was a Boston Globe bestseller and won the Christopher Award. Disclaimer: I received a copy of this book for the purpose of completing my review. All opinions are my own.